If you have a trampoline in your back yard, then you will without doubt want to take good care of it so that you can enjoy it for many years. If this is the case, you may be worried about whether you should allow your kids to bounce on the trampoline wearing shoes. However, you may be concerned that your children may slip or fall bouncing in regular socks or with bare feet. Nowadays, you can purchase trampoline socks to solve this issue. 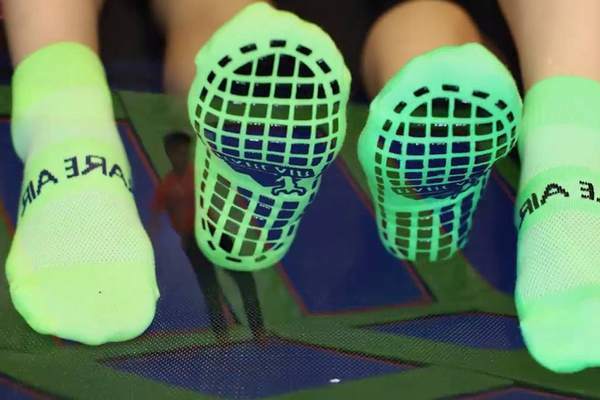 So, should you buy trampoline safety socks? Do shoes ruin a trampoline? Read on for our handy guide. Do shoes ruin a trampoline? ﻿﻿Why can't you wear shoes on a trampoline﻿﻿? ﻿What is a trampoline sock﻿? ﻿﻿Where can I buy cheap trampoline socks﻿﻿? This really depends on what type of shoes you are wearing. 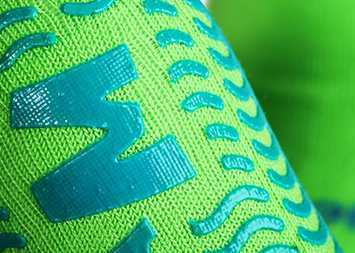 If you wear heavy-duty shoes or sneakers designed for wearing on the street, this can cause the jumping mat to wear out prematurely due to increased friction. Also, it can be difficult to bounce as nimbly wearing shoes. However, if you have slipper specially designed for gymnastics, these are perfectly fine to use on a trampoline. Why can't you wear shoes on a trampoline? As we mentioned above, wearing shoes with a leather or rubber sole will rub against the jumping mat. While doing this once or twice probably won't cause excessive damage, doing so consistently can wear your jumping mat out prematurely. Also, wearing these types of shoe can make performing particular jumps or tricks difficult to impossible. Therefore, we recommend jumping in bare feet or using trampoline jump socks. What is a trampoline sock? 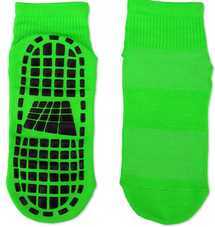 Trampoline socks are special woven socks with a non-slip design on the sole. They are like a thinner version of slipper socks that you can buy to keep your feet warm, with a rubberised pattern on the sole. This can make jumping on a trampoline safer and more hygienic for kids. They can be purchased in a wide range of colours, styles and sizes. In fact, you can even buy trampoline socks for toddlers. If you're considering purchasing grip socks for trampoline, you may be wondering if they're worth the investment. 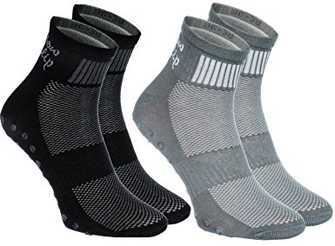 In fact, there are several key benefits of trampoline jump socks that can make them a great choice. First of all, they reduce the likelihood of slipping on the trampoline jumping mat. While this is less likely with bare feet, slipping while wearing regular socks is quite common and can lead to nasty falls and accidents. 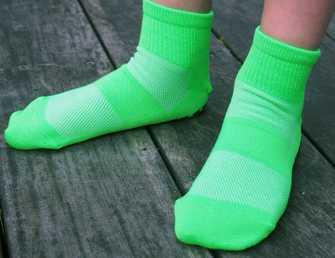 Therefore, trampoline socks can help to improve safety, especially for little kids. Another key benefit of trampoline socks is that they are more sanitary than bare feet. If lots of kids are using the trampoline, bacteria and conditions like verruca can spread like wildfire from child to child. This is why most trampoline parks insist on trampoline socks for all users to manage this risk. If your child is sharing a trampoline with others, wearing trampoline socks is a very sensible precaution to prevent infection. Finally, many kids love to wear trampoline socks because they look so fun! Available in an incredible range of colours and designs, you can find something to make your kid stand out from the crowd. If you run a trampoline business, you can even have custom trampoline socks made as promotional items. You may be wondering: why purchase trampoline socks when you could just go barefoot? The first aspect to bear in mind is safety. 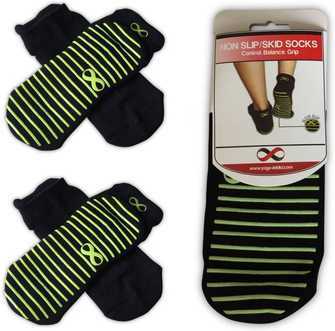 While slipping is less likely with bare feet than regular socks, trampoline socks give you the best protection from slips and falls whilst bouncing. This can hep to prevent nasty accidents, especially for little kids whose coordination is not yet fully developed. That's why we especially recommend trampoline socks for toddlers. Another reason that trampoline socks trump bare feet is that they provide protection from the bacteria and germs that can build up on the jumping mat. They can also help prevent your child catching a verucca from other children. This is particularly worth bearing in mind if your child shares a trampoline with others. If you're visiting a trampoline park, then wearing trampoline socks is doubly important as they are used by so many people. However, in order to prevent injuries and control infection risk, most trampoline parks insist on socks in any event. So, while trampoline socks aren't an absolute necessity, they are an ideal option. Where can I buy cheap trampoline socks? Luckily, it's extremely easy to find cheap and attractive trampoline socks. They can be easily purchased online at Amazon. If you're hoping to purchase trampoline socks online for family, you may be wondering which the best brands are to give you great safety and protection. We've found two options that we think are a great choice for most users.